This autumn season has come on in an especially distinct and colorful way, with plenty of cool air and rain, beautiful tides and freshly revived river flows too. We saw fresh snow on the mountains right away. And the fish have responded by feeding more on the beaches, fighting harder, moving more, and leaving us in awe at times. Each season here has a distinct range of qualities, good points and low moments, great fishing days and days that humble. But there is no other season quite like October. Since the autumn Solstice turned last month we have had several brief spells of cool dark weather and rainfall, and even a few good spikes in river flows. This has really moved the fish upriver in most of the rivers, The Salmon and summer run Steelhead, and Cutthroat trout are widespread in the coastal rivers and streams right now. And we are catching some of the best sea-runs of the year on the beaches. Over the last week or more the rivers have been dropping into lower and more approachable flows, and the fly fishing conditions are very good. NOW! Dry line Steelhead fly fishing with smaller, (size #4, #6, #8), classic soft hackle wet flies, streamers and Speys will be sublime. Despite the popularity of many of the large fluorescent colored Pacific Northwest Steelhead flies, we will often find that in low water flows, and sunny afternoon light, the softer more natural colors, and the earth tones, will yield better results. And you will want to be skating those big fluffy dries and waking patterns, like the Stimulator and Bill McMillan's Steelhead Caddis. We are also enjoying a very unusual "Indian Summer" kind of warmth; refreshingly cool misty mornings, beautiful sunny warm afternoons and pleasant evenings. Likewise our beaches are in perfect condition, with Coho salmon and autumn fat sea run Cutthroat available to us on every tide. And the waxing Hunter's Moon coming on this week has the tides here especially favorable too. To cap it off the forecasts ahead- for the next week to ten days- are showing a persistent high pressure system holding over us, with dry and fair weather, mild temperatures and very little wind ahead. I like Dr Cliff Mass weather blog for these timely updates. With the saltchuck conditions this good here now I will be focusing my fishing efforts on the beaches for as long as possible. This can run well through Thanksgiving in some years. 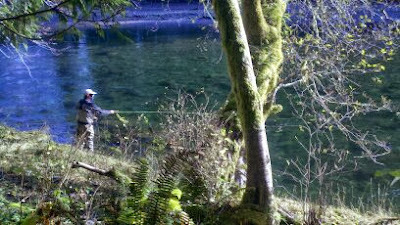 Rarely do we get to enjoy this kind of light, dry air and warmth on our autumn Cutthroat and Coho beach outings. We have never minded wind, clouds and rain, and some pretty choppy water at times, because the opportunity to catch the strongest and biggest fish of the year has always been in the fall here. The cooling effect of cloudless nights has helped to drop water temperatures a few degrees here over the last month. And this really turns on feeding fish close to shore. It really can not be much better than it is here right now. Beginning in mid September we witnessed several sea run Cutthroat with some very large Herring hanging out of their mouths. It is not uncommon that trout and other fish will regurgitate prey during playing and landing. These Herring were in the one year class, at about 5 to 6 inches long. Don't be afraid to tie your streamers a little longer now. I am tying my Clouser Minnows at about 3 to 4 inches long now. The Sandlance and Surf Smelt too will be fully mature. Recently there have been some sightings and reports of American Shad in this area. No doubt our trout and salmon would be taking full advantage of these "forage fish" as well. A little blue tint to the flies in the topping material can help to emulate that distinct Herring blue color. And the Coho will not hesitate to take this fly too . . .
Wild Coho, caught on a 4 inch #4 Clouser style herring fly.